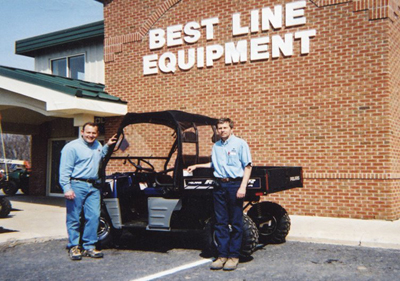 Best Line Equipment was founded in 1985 by Michael Houseknecht in Muncy, PA. Starting in a rented service station with lawn and garden equipment, Best Line has grown to 13 locations and boasts over 18,000 pieces of rental equipment. MikeH, President and Owner, now resides in the State College area with his wife Torie and 2 of their 8 children. Best Line now has 3 powersports dealerships, with locations in Muncy, Towanda, and Centre Hall. The Polaris brand is a feature at all 3 locations. The power sports business is overseen by Chief Operating Officer, Mike Getz. Mike G and Mike H were friends when the company began in 1985. Mike G provided part time help from 1986 to 1997 as the company developed from its infancy. Once Mike H had enough full time employees in 1997, he no longer needed Mike G’s help. In September of 2000, Mike G returned to Best Line and left PPL Company. He returned to the company as COO to help advance the business. Mike provides oversight of the Sales, Marketing, and all operational aspects of the business. He is an avid snowmobile rider, ATV enthusiast, and has always been passionate about Polaris products. Mike G resides in Muncy with his wife of nearly 25 years Lynn and their two daughters. Best Line has 6 Polaris Master Service Designation repair technicians, 3 Polaris full-time parts personnel, and 5 full-time Polaris salespeople. Best Line enjoys and appreciates the relationship with SSRTA and thanks everyone for the machine, parts, and accessory business. We hope to continue getting the Polaris brand further involved with SSRTA and promoting the expansion of safe riding in PA!